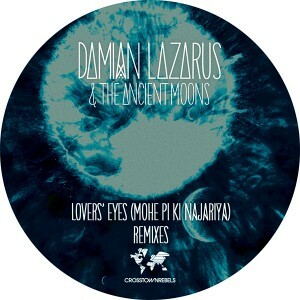 Damian Lazarus and the Ancient Moons debut single on Crosstown Rebel’s get’s remixed by Carl Craig & Willie Burns. The original version of 'Lovers' Eyes (Mohe Pi Ki Najariya)' is the first release from Lazarus's new collaborative artist project, and is quickly becoming one of this years anticipated records. Now, hot on it’s heels comes two killer remixes to compliment the original. On the A Side Carl Craig impeccably tweaks and twists Lazarus original version into submission. A barrage of growling synths and drums drives this version front and centre to the dance-floor, Carl works his magic in creating something truly unique with this remix. He succeeds in doing justice to original whilst taking it further and darker into the abyss. On the flip and Willie Burns (Crème Organization / L.I.E.S.) loops Fareed Ayaz, Abu Muhammad and Hamza Akram vocals to maximum hypnotic effect. A cavalcade of lopped, layered vocals build and beguile over the swelling electronic resonance of Willie’s sparse yet powerful production. Two great remixes that are already seeing some heavy disco rotation, and are set to highlight this Summers dance-floors with some Quwwali Electronic mayhem!